Imagine this hypothetical. For the past few years, you’ve worked full-time and have made enough money to regularly date, go out with friends, and attend expensive sporting events. A few years back, you thought ‘this is a great life.’ You hated high school so much that you thought ‘I’ll never go to school again after I graduate.’ Part-time work was far more satisfying than learning in school and you couldn’t wait to work full time and become independent from your parents. Back then, you enjoyed work. Now, though, you’re frustrated. Periodically, you get a raise, but friends who went to college now earn much more money than you. You also need more money because you recently got married, you want children, and you and your spouse want to buy a house. This isn’t exactly the life you envisioned. You need a change that will financially improve your life significantly for you and your family for the rest of your life. The change could be going back to school. Six years ago, you didn’t have the maturity to sacrifice short-term pleasure for long-term financial gain. The chart says that the weekly median salary for a high school graduate in 2012 was $652. That’s $33,904 per year. 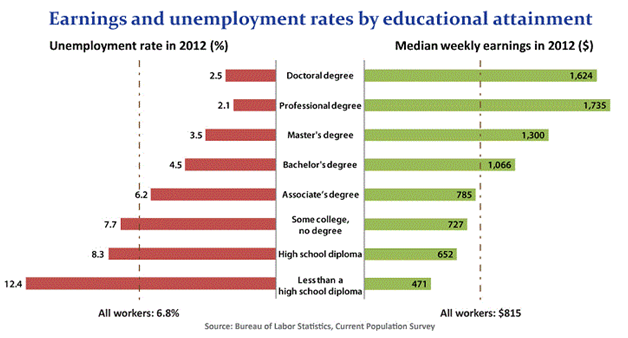 People who attend college but don’t earn a degree earn $727 weekly, which is $37,804 annually. The increase is partly attributable to the jobs skills that people learn even when they don’t earn a degree. * Bachelor’s degree: $1,066 weekly or $55,432 annually. * Master’s degree: $1,300 weekly or $67,600 annually. * Professional degree: $1,735 per week or $90,220 per year. And salaries are only part of the story. The BLS reports that the unemployment rate for high school graduates who are at least 25 years old was 8.3 percent in 2012, but the rate falls to 6.2 percent for associate’s degree graduates, 4.5 percent for bachelor’s degree graduates, 3.5 percent for master’s degree grads, and 2.1 percent for professional degree grads. The Occupational Outlook Quarterly report lists the professions that require bachelor’s, master’s and professional degrees. “Occupations that typically require higher degrees often have higher wages,” according to the report. Before going to college, you should consider what occupations interest you, which occupations you think you can be good at after training, and how much they pay. The Occupational Outlook Quarterly report lists which occupations have “high earnings premiums” and “low earnings premiums” when you earn an associate’s, bachelor’s and master’s degree. The best occupations for high school graduates who earn an associate’s degree include molders, plumbers, auto mechanics, butchers and carpenters (Table 23). Plumbers earned a median salary of $37,927 in 2006 if high school graduation was their highest educational attainment, but $45,005 if they went to college for up to two years. Earning a bachelor’s degree helped property and real estate managers the most because their median salary in 2006 was $33,968 when they graduated high school and $61,963 when they graduated college (Table 16). Managers of non-retail sales workers and insurance sales agents also benefited tremendously from college, while postal service clerks, tellers and data entry keyers benefited the least (Table 17). Earning a master’s degree helped financial analysts, tax preparers and financial managers the most (Table 9) and editors, writers and architects the least (Table 10). Financial analysts earned a median salary of $74,760 if they earned a bachelor’s degree and $109,983 if they earned a master’s degree. Returning to school can sound intimidating, particularly if you lack financial resources, but many organizations and governments can help students with information and financial aid. WebCollegeSearch, for example, helps prospective students find schools which offer programs that fit their schedule and budget. 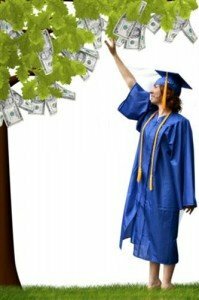 Web College Search believes that everyone should have the opportunity to improve the quality of their lives and their financial security by going to college. Check out our tools at the right to learn more!